The project’s brief was to design a student center that would upgrade existing facilities on campus. The new center was to include a number of sports facilities including an indoor swimming pool, a multi-use gymnasium, \basketball courts, indoor football and handball courts, squash courts, a refurbished track, and a green Field. In addition to the sports facilities, the student center was also to accommodate a 280-seat auditorium, a 250-seat amphitheater, a cafe, student activity rooms, an internet room, and an underground parking area for around 200 cars to replace the parking lot that previously occupied the site. The design brief for the center also included guidelines established by the new campus masterplan which incorporated sustainability at its heart . As the first building of the masterplan – designed by Sasaki Associates- the Charles Hostler student center needed to present a model of environmentally responsive design for the university and the Middle East. In addition, given the damage to Beirut’s infrastructure during the civil war and the lack of a reliable municipal infrastructure, sustainability was identified by the design team as a necessity to ensure the center’s continuous operation in a future with an uncertain energy and water capacity. For example, as a result of the failure of the electrical grid in Beirut to meet the high demands of hot summer months, it became an imperative to design an autonomous building that had low energy needs and a backup energy system. In order to achieve the project’s goals of energy and water security, the design of the center had to combine passive design strategies with active systems. The passive strategies would reduce energy and water use throughout the year and especially in spring and autumn season, while the active systems (efficient heating/cooling and renewable energy generation) would help reduce energy loads and provide a dependable backup to public utilities. In their approach to the center’s basic building form, the design team preferred not to create a single massive building to hold the program’s athletic and meeting facilities, and instead chose to develop a diverse complex that distributes the building volume. 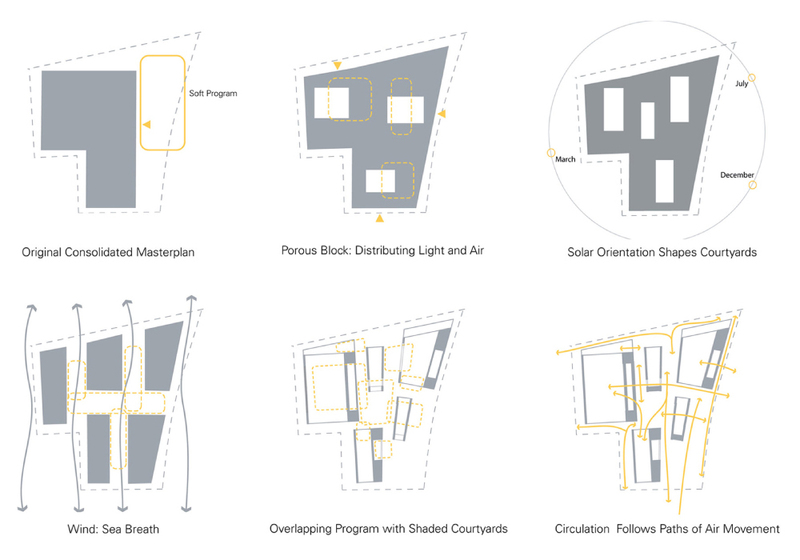 The building form was thus broken into a cluster of five low rectilinear volumes, organized around a series of radial lines oriented toward the sea (figure 1). Together, these buildings create a continuous, layered field of outdoor habitable spaces that include courtyards, gardens, occupied green roofs, paths, a cafe, and a number of lookouts facing the sea. This clustered form and scale helped create shaded intermediate spaces for circulation and social interaction. 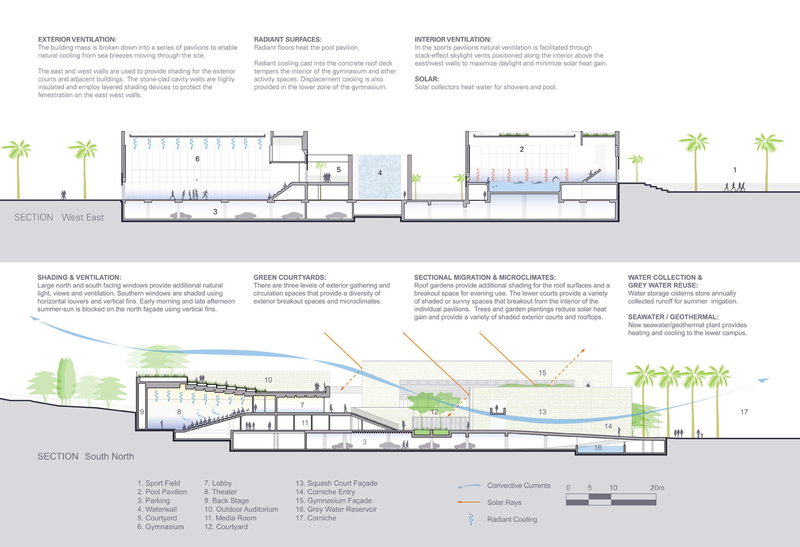 These outdoor spaces are further moderated as the design directs sea breeze through them (figure 2), creating temperate microclimates around the center (images 2 and 3). 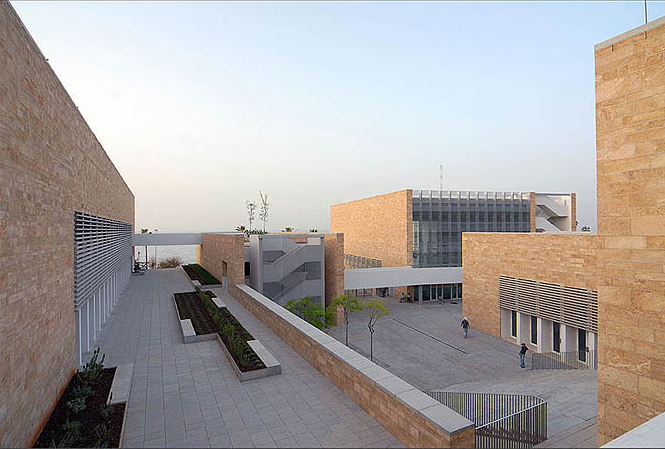 According to the architects, inspirations for the center’s scale and massing came from the campus’s historic section as well as from lebanese traditional courtyard houses. The chosen scale and cluster forms allowed the architects to use a traditional shading technique of self-shading as buildings cast shadows on each other and on outdoor spaces and courtyards (Figure 3). The design was also inspired by traditional lebanese houses in its orientation to capture sea breeze for cool night time ventilation. Contrary to established rules of thumb, and contrary to the AUB’s new masterplan which recommended orienting buildings along the east-west axis to reduce heat gain, the architects’ analysis of the shading properties of rectangular volumes at Beirut’s latitude demonstrated that north-south oriented courtyards provided 40% more shade throughout the year. More importantly, this orientation enabled the courtyards and outdoor spaces to open up to prevailing sea breezes. As a result of this orientation decision, two thirds of interior spaces including those used most during daytime, offer natural ventilation through large operable openings on the north and south facades. Operable skylights were also used over the pool and gymnasium to enhance ventilation through stack effect (images 6 and 7). To mitigate the heat gain implications of this orientation on the east and west facades, the two facades were designed mostly as solid masonry walls, with glassier curtain wall facades applied to walls to the north and south faces (image 4). Images 4 (left) showing east and west walls treatment. Copyrights: Mazen Jannoun. Image 5 (right) shows integrated shading devices. Copyrights: Paul Crosby. Integral shading devices were also used to shade the buildings further. Exterior louvers of pre-cast concrete or locally crafted aluminum were strategically placed on openings to shade the interior from direct sunlight (image 5). North facades were protected using vertical fins while south facades were shaded using both horizontal louvers and vertical fins. In addition, the buildings are highly insulated on all external walls and roofs and incorporate cavity walls and low-e glazing, all of which help reduce interior heat gain further. Roof gardens can also be found in certain roof locations to shade the roofs further and to provide a breakout space for night time use. The center requires virtually no daytime electrical illumination, with two thirds of the interior spaces day lit, including the most heavily used daytime spaces – the swimming pool, the gymnasium, and the café (images 6 and 7). 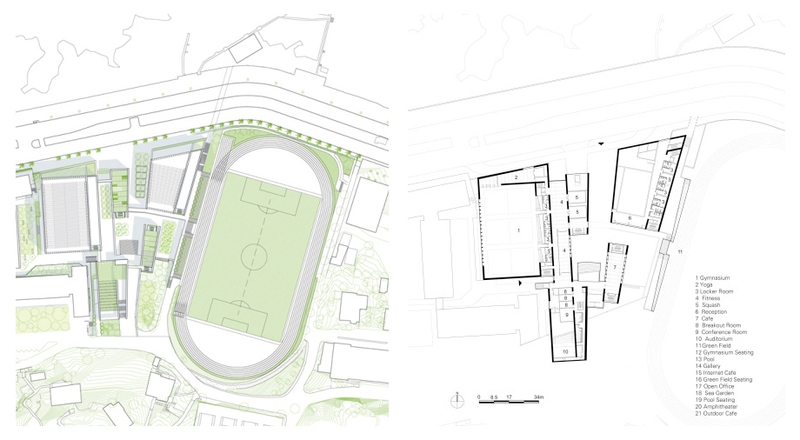 Images 6 (left) and 7 (right) showing natural ventilation and daylighting of spaces using integrated shading devices using north facing openings and skylights Copyrights: Paul Crosby. In terms of the materials used in the center, the buildings mostly use durable and locally available building methods and materials such as Syrian sandstone cladding, concrete posts and beams, terrazzo flooring, and interior plaster surfaces. The use of the Schüco curtain walling system is limited to parts of the north and south facades. The architects also adapted and developed Lebanon’s conventional exterior wall to improve its assembly conductance (U-value) and thus improved its thermal efficiency. Like much of conventional construction in the Middle East, the Lebanese conventional wall is a single layer of hollow bricks covered by plaster, with a total U-value of 2.5 W/m²K. To improve the envelope’s performance, the architects developed it into a double-shell, stone-and-concrete insulated cavity wall, reducing its U-value to 0 .7 W/m²K, approximately 4 times as efficient as the conventional wall. With one of the project’s goals being to reduce the buildings’ reliance on the electricity grid, much of the design team’s attention was given to incorporating innovative active system for cooling, heating, and ventilating the center’s high occupancy spaces. For cooling, the design of the center features a highly-efficient seawater geothermal radiant cooling system. The system runs cold water from deep cold sea wells, through a closed-loop heat exchanger to radiantly cool densely populated interior zones such as the gymnasium, pool, theater, squash courts, and café. At the loop’s end, the warm water is returned to the sea. The location of the warm water return was carefully chosen to be in a temperature-compatible area to protect marine life, which can be adversely affected by water temperature increase. The electricity load of this efficient cooling system is limited to operating low-energy pumps, and is negligible when compared to conventional cooling systems. In fact the system was so efficient that it is currently used to provide cooling to the entire lower campus area. In addition, the use of a radiant cooling system eliminates energy-intensive, noisy, and ugly rooftop chillers, and creates opportunities for the design team to replace them with roof gardens (figure 4). To provide heating, the design features solar thermal panels placed atop the gymnasium and swimming pavilion roofs to heat the pool and the water used in showers. Radiant heating is also used to warm the pool deck and other interior spaces, with additional heat used drawn exclusively from waste heat or from steam from AUB’s physical plant. During the summer, excess thermal energy can be used for chilled water production. For ventilation, the supplementary mechanical system chosen is a displacement ventilation system which provides dehumidified fresh air using high efficiency air handling units and heat recovery systems. Compared to an all-air system, this system reduces consumption significantly. The center also features a number of efficient systems that help it reduce its energy intensity further, such as a low energy absorption chiller to provide chilled water, and energy efficient light fixtures. For optimal use of the systems above, a digital Building Management System (BMS) is installed to operate lighting, temperature, and humidity controls according to outdoor conditions. The system is also use to monitor energy usage to optimize energy conservation. A pre-construction simulation estimates that the center would consume 673 MJ/sqm annually (38% below base case), and would have an annual carbon footprint of 65 kg CO2/sqm. 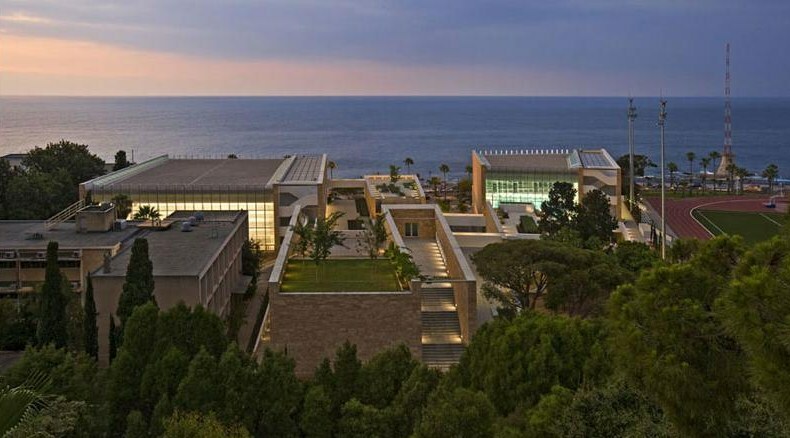 With potable water a scarce resource in Beirut, the Charles Hostler Student Center incorporated a gray water recycling scheme which recycles 50% of water on site. The recycling scheme collects water runoff from site drains and roof tops, which was previously diverted through the car park to sea. The grey water is then used after treatment in toilet flushing and in landscape irrigation. Recycled water is also partly used in outdoor water features, which the design team refers to as ‘water walls’. These water features help cool outdoor spaces using evaporative cooling, a traditional Middle Eastern cooling strategy. The center is also set up for future installation of sea water desalination to produce drinkable water on site. The desalination process can either use reverse osmosis or solar desalination using the large array of solar thermal collectors on rooftops. In terms of landscape, native drought-resistant trees and plans were chosen for use in landscaping the courtyards and the roof gardens of the project. In addition, all existing trees on site were protected to provide shade for the buildings and the outdoor spaces. Native trees displaced during construction were preserved and then replanted on site.